MWC 2016: Will the crowdfunding smash launch on time? When the Omate Rise popped up on Indiegogo, it smashed through its goal raising well over $200,000 in just a couple of days. The circular smartwatch that comes with 3G and runs on full Android, will cost $279 with a special carbon fibre limited edition model priced at $299. Omate was showing off the Rise at MWC. The problem? It's far from the finished product and more of a working prototype. It was running, but lacked the "rugged fashionable look" we'd been promised. It should have been a nice polycarbonate plastic body with stainless steel screws and sapphire coated glass. But it was all plastic and not so fantastic. The black leather strap, which is interchangeable, didn't feel particularly luxurious either. It's not too far away from the Omate Racer smartwatch in a lot of ways. The look is distinctive, especially once the carbon fibre bezel is in place, but it's pretty difficult to get a good idea of what it's really going to feel like around your wrist. At the heart of the Rise is the 1.3-inch TFT screen, which delivers a solid 360 x 360 resolution and certainly produces vibrant, bright results. It was however covered in plastic, which again is not how the watch will ship. Tapping the sole physical button to turn it on, the plastic coating definitely made the screen less responsive to swipes. Flip the watch over and you'll find a compartment to slide in a Nano Sim, so you can make and take calls using the microphone and loudspeaker up front. 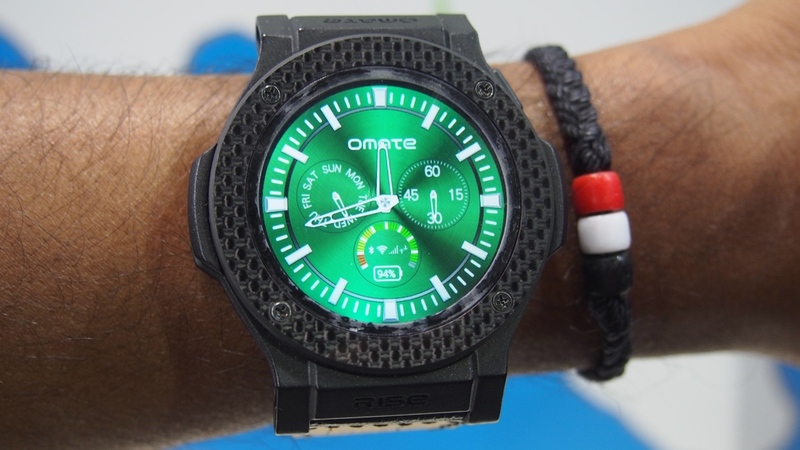 Providing a standalone smartwatch is definitely Omate's thing right now. They've even done the same with its new K3 kids smartwatch. The Rise runs on full Android 5.1 Lollipop with the company's user interface on top. That's a welcome change from the Nucleus OS it was running on the Racer and means you can reap the benefits of Google's OS including downloading apps. It still feels very Android Wear in approach and there's a handful of decent watch faces to choose from. At the moment though, it's hard to judge the Rise. For a product that's expected to launch in the next few months, it needs more than just a simple spit and polish. On paper, it's a formidable smartwatch for the price. We haven't even mentioned the fact it also has GPS, 4GB of storage and can be paired with Bluetooth headphones and heart rate monitors. Let's just hope Omate can pull things together and not leave those crowdfunding spenders waiting too long for the finished product.